THE LORAX marks Hollywood’s fourth attempt to take one of the classic children’s stories of Dr. Seuss and bloat it to feature length to please the kids. Inevitably, it falls into the exact same trap as HOW THE GRINCH STOLE CHRISTMAS, THE CAT IN THE HAT and HORTON HEARS A WHO – when your film is based on a thirty-page illustrated children’s’ book, you’re going to have to stuff a whole lot of padding into the film in order to hit the ninety-minute mark. 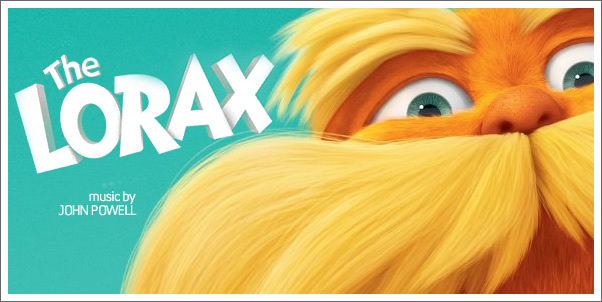 If the first three films were bogged down by extended sequences of mugging from Jim Carrey, Mike Myers and Jim Carrey again, THE LORAX arguably commits a worse sin – it becomes utterly hypocritical. The film takes the anti-pollution, anti-corporation message of the book to extravagant levels, essentially doing what Pixar’s WALL·E did with a fraction of the subtlety. But don’t expect anybody to take the message seriously when its titular character starts appearing in ads ranging from Mazda to IHOP – truly fighting the big corporations, there. JOHN POWELL probably has more experience at scoring animated films than any other composer alive – THE LORAX marks his seventeenth – and it’s no surprise, given how very good indeed he is at the genre. Currently, he seems to be focusing on little else, but his run of quality in recent years has been particularly high, with 2010’s stunning HOW TO TRAIN YOUR DRAGON leading into a pair of slightly inferior, but still extremely enjoyable works in 2011: KUNG FU PANDA 2 and MARS NEEDS MOMS. His assignment to THE LORAX was perhaps slightly predictable given his involvement with HORTON HEARS A WHO (a zany, tremendously enjoyable and somewhat underrated score), but it has allowed him to make yet another frenetic, colorful addition to his canon.